Halloween is here so forget about the pop and classic rock music on the radio, dim the lights, light some black candles, and turn on one of these albums. 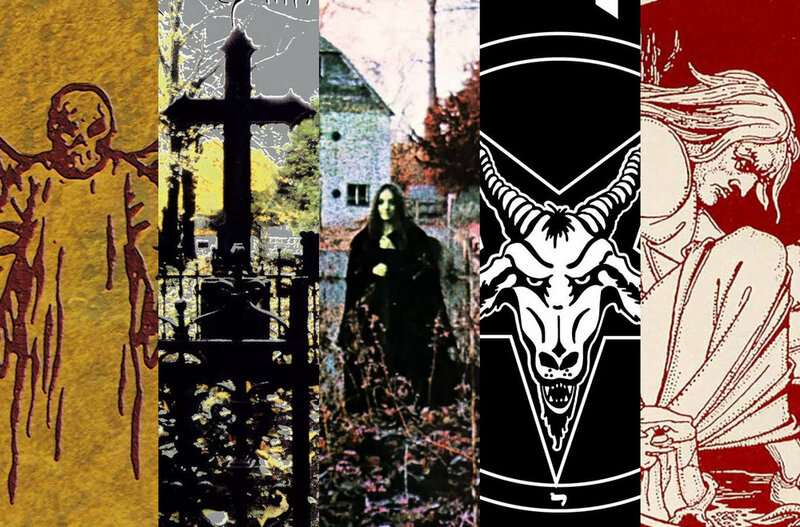 Last year I made a list of the 6 MUST WATCH HALLOWEEN MOVIES so this year I give you 5 of my favorite dark/dreary Doom albums that have been on my playlist all October long. Notable song: "No Angel or Demon"
We begin this list with the newest band of the six who quite possibly has the most "vintage" or "lo fi" sound of the rest of the albums on this list. Not many bands can traverse the sands of time and deliver a sound that sounds like it's straight out of the early 70's but Witchcraft does just that, and they do it very well. Apparently recorded in a basement using only vintage gear, the sound can be a bit harsh at times with drums sounding a bit thin, but in an age of overproduced metal using everything and anything digital, it's refreshing hearing an album that takes us back to the analog age. Each song is filled with fuzzy blues riffs and catchy hooks with haunting vocals and simplistic drumming. Withchcraft's freshman album is a dark, haunting, and rather charming album that brings back the heart and sound of the 70s. Cathedral's "The Carnival Bizarre" is an absolute blast to listen to. Very kitschy but in a very entertaining way. Taking many references from the macabre and creepy, you may even hear quotes from the mighty Vincent Price in "Hopkins (witchfinder general)." Each song has its fair share of catchy riffs, scratchy vocals, and lo fi drums that deliver a headbanging good time. If you've never listened to anything from this legendary band, this is the place to begin. Petagram's very first album and possibly their best and most influential release. "Relentless" is slightly more up tempo then the rest of the albums on this list, but only slightly. There's a hint of a punk influence mixed with a very clear influence from the founders of metal, Black Sabbath. Songs like "Relentless," and "Sign of the Wolf" have an up tempo pace with pulverizing riffs that sound like their swinging at you with a 50 pound mallet. Slower, more brooding songs like "All Your Sins" and "The Ghoul" sound like they grabbed the 80 pound axe. A very sinister and dark release that is an absolute classic in heavy metal, I strongly recommend this album to any metal head. Death Magic Doom is one of the newer releases (2009) from the extremely influential Swedish Doom Metal band Candlemass. Many bands fall into predictable ruts and pump out boring music as they get later into their careers but that's not the case with Candlemass. Of course I will always recommend the great "Epicus Doomicus Metallicus" over this album but Candlemass proves that some metal does age well with this release. Extremely dark guitar, unexpected tempo changes, and the operatic vocals of Robert Lowe create a dreary atmosphere that any Doomhead will be able to appreciate. Detuned, fuzzy, slow, and heavy. Heavily overdriven amps mixed with the melancholy vocals of Scott Reagers create a haunting atmosphere that will put you in the right state of mind on Halloween night. Every song is quite slow but remains heavy and interesting to the listener even though the riffs may be somewhat simplistic. An excellent Doom album from one of the leading bands of the genre. If you're a fan of Black Sabbath you'll enjoy this album. Undoubtedly one of the most, if not the most, influential album in heavy metal music and certainly the most important (subjectively) Doom Metal album of all time. Made famous for their use of the Devil's Tritone arpeggiated chord in the very opening of the album on what is in my opinion, the heaviest song ever written, Black Sabbath. This album had to be number one on this list and should be number one on any list of Doom albums. This album gave the world Ozzy Osbourne and all of his madness, and for that I am grateful.